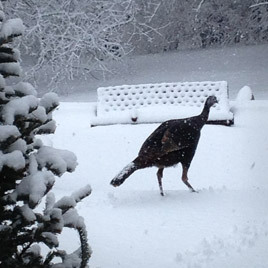 I was just now looking out the window, and a turkey hen walked across the lawn. The ground is white and it is snowing in steady, small flakes. It is not an unusual event around here, to see a turkey, but her size, plodding movement and the contrast of brown against the white ground – it was both stunning and comic. My inner smile words at this moment were, “here it is, real wealth. It’s that sense of enough. Right here, right now, enough wonder in the world.” A conscious breath and ½ smile later, I watched the turkey disappear around a corner of brick wall. Then something unique happened. She had evidently turned around behind the wall; she came back around the corner and stared at me for awhile, 30 seconds or so. It seemed a long time. Then she turned and went back on her original trek. Just when you think life could not be any more astonishing…. I wonder, did I catch her attention, interrupt her, when I broadcasted energetically, “life is grand?” So, here’s the learning I take from this. One turkey hen thinks I might be getting it right. That’s an audience.